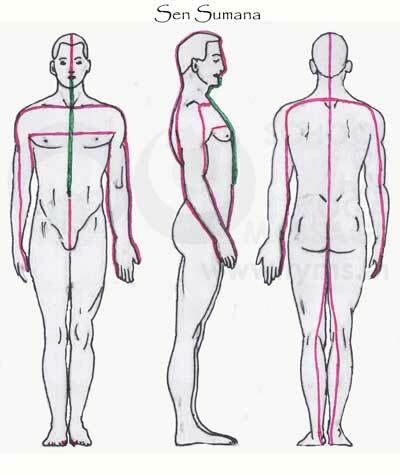 The concept of meridians in Eastern philosophy is not new. 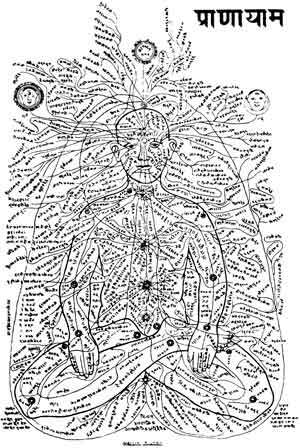 TCM or Chinese medicine meridians used in acupressure and acupuncture are of course are well known. In the Indian system the Yogic Nadis are also used in ayurveda and other Yogic practices. Thai massage or Nuad Bo Rarn as it is know in Thailand uses the Indian yogic system for its meridians. Subtle differences do exist between Thai Sen (meridians) & Yogic Nadis but the concept of Prana or Lom(in thai) running through them is the same. The Yogic system believes that there are 72000 such meridians or rivers of Prana crossing the body and as they cross each other the whirling of the Prana on these points of intersection create vortexes. The Chakras. Thai Sen lines are similar in conception and flow, as the yogic lines. Yogis also talk of how each Chakra is associated with various organs/ glands of the body. 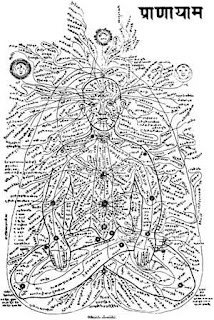 Like the Sahasara is related to the corpus collosum, the Ajna chakra to the Pineal gland, the Vishuddha to the thyroid, the Anahata to the Thymus, Manipura to the Spleen, and the Swadishtahana plexus to the prostate. To a rationalist this might seem like a lot of mumbo jumbo. Rivers of Prana? Really! If you cut the body up can you see these rivers? Measure them or touch them? It sounds difficult but as a practitioner of Thai yoga Massage I can feel them. I can feel the ebb and flow of prana but as a teacher of Thai Yoga Massage. How can I explain this to one who might not have developed the subtle touch yet. Over the years I struggled with trying to explain to my students (the skeptics) that these lines exist and that you can feel the breath on them. The answer to the question lies in anatomy. I got interested in other therapies that are derived from modern anatomy. Some of them less ancient than Thai Yoga massage. One of them was Anatomy Trains as conceived by Ida Rolf’s student Tom M. Myers. What Tom Myers was talking about, while derived from Rolfing, was presented in a much more simple manner. His view of the human system was quite revolutionary at least for me. Tom Myer's theory was simple, the hidden organ of the body that is now acknowledged for its existence by modern medicine, is the Myofascial net. He calls it the organ of support. The myofascial net includes everything that keeps the body together. That means muscles, intra muscular fascia, inter muscular fascia, tendons, ligament, bone and even down to the connective tissue, the Dura Mater covering the brain. Everything that helps keeping the body in shape and organized is the organ of support.It keeps everything organised inside this very large water balloon which we call the “I” . It prevents the organs from sloshing around and therefore in working order. It is with us (albeit in changing form) from the moment of conception to death. It is the organ of support and one that keeps us in one piece even when have our arm broken. Tom Myers concept was simple. None of the bones in the body actually touches each other. Instead Myers asks us to look at the human system more as a skeleton wired or held together in place by a combination of muscle, tendons, ligament and cartilage. Not only the bones but even our internal organs are held in place by this amazing net. It is what stops the left lobe of our liver from popping out of our mouth as we are doing a yoga head stand. What was even more mind boggling about Myer’s view was that arteries, veins and nerves use this net as a scaffolding to travel from one point to another to provide nutrients, hormones and information which creates the flow of life in us. Surprisingly Tom Myers went on to explain that this organ of support aggregates the various pulls and tensions of gravity working on us through specific lines. He calls these lines meridians too. The difference is that his lines are lines of tension or muscular pull. Something like ropes in a sail boat that help keep the mast upright even with strong wind and gravity working on it constantly. Myers talks of ten major lines of pull. As I studied more I realized that the lines he was talking about were often following the same track as Thai Sen lines. For example the Deep Front line is almost exactly the same as Sen Sumana or in the Indian yogic system the Sushumna Nadi. This line runs along the inside of the calf and the legs and into the deep muscles of the Psoas and then following the anterior longitudinal ligament it loops around the linea alba to hold all our organs in place. Or Myer’s Lateral line in the leg follows the route of Sen Kalathari providing a basket weave that allows for lateral integration in the body. Of course differences exist but the tracks of these lines remain almost the same. I found it quite fascinating that the Yogis, 2500 years ago, seemed to have realized the same truth without MRIs, X rays and dissections, what modern anatomical research is coming to realize only now. The concept of myofascial meridians gets even more complex because the lines do not stand alone and transmit pulls independently of each other. Instead they interact and share the pull at points of intersection. Points like the extensor reticulum at the ankle, the knee joint, the AIIS, ASIS, along the spine, on the anterior side along the Linea alba, the sternum and even at the neck. The truth is that everything is interconnected in the human body and everything interacts with the other elements to create the flow of life. Breathing is only one of the autonomic movements that occur in the human body but it is among one of the most frequent and more importantly one of the most essential. It originates muscularly at the core of the human system. In the book "Dance Anatomy" by Jacqui Has is point that the mechanical aspect of breathing runs through the entire body. Put in the context of myofascial meridians it tells us that even a movement like breathing which begins at the core of the human system spreads mechanical tension along these myofascial meridians and distributes it across the body. This is the ebb and flow that a Thai Yoga Massage practitioner feels when in contact with the client. You can feel the pull of an inhalation and push of the exhalation even down in the calf. It is subtle and requires training but it exists physically. To feel the breath over the body requires not only subtle sensitivity but also stability. Conventional movement oriented Thai Yoga Massage which is often taught in commercial schools limits the ability to sense this movement. Styles of Thai massage taught by Master Pichest Boonthume or in advanced courses at the School of Thai Yoga Massage India need the practitioner to linger longer on points of tension along the Thai Meridians. When the practitioner follows this style, she can meditate and feel the breath flowing over the body. Then Thai massage becomes a therapeutic meditation as against the conventional meditation in movement Thai Massage is known for. Further research needs to be done on the impact of the interaction of these lines of myofascial pull and other circulatory functions both independent and in interaction with the mechanics of breathing. I really like my antique singing bowls it is beautifully created and also the chime is actually light as well as soothing. I personally use it in my junior high school classroom as a signal with regard to mindfulness as well as my personal students' response continues to be extremely good. Even just in a loud course, the chime of the mini singing bowl provides their attention back. I highly recommend it!